As a novice or seasoned public speaker becoming better isn’t an option… it’s an expectation. 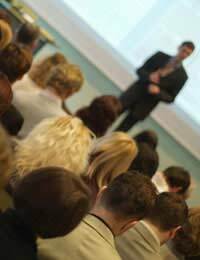 Given that fact, it will absolutely behove you to engage in some speaking exercises as a way to rapidly and effectively increase your speech making skills.Below are some exercises that countless theatre folks have found useful throughout the years and which translate well to the public speaking arena. Without a doubt, this is one of the least favourite activities of most public speakers (the majority of people simply do not enjoy listening to or watching themselves on tape), but this exercise produces fast results. Have a friend or colleague tape you at an actual or simulated public speaking event and then review the video in the privacy of your home. Watch yourself for moments of greatness… and for moments of weakness. For instance, are you mumbling at any points? Do you have a tendency to read, never looking up from your notes to acknowledge listeners? Is your cadence too rapid? After evaluating yourself on camera, you’ll have a much better indication of where you need to focus your attentions. Each of the above phrases is an example of a “tongue twister.” Often, actors use such sentences as “warm ups” to encourage excellent diction and appropriate cadence before a performance. As a public speaker, you can do so, too. Repeat each phrase (you can search for other tongue twisters online) five times, attempting to perfectly and naturally recite the words without sounding too “robotic”. This exercise will not only help you improve your enunciation; it will also help you focus on becoming aware of what you’re saying and how you’re saying it. Not only is this exercise useful for exercising your brainpower and improv skills, it will also help you become more comfortable when speaking to a crowd. Additionally, it can increase your ability to answer unexpected questions with ease. Many thespians like to sing (even if they aren’t in singing roles), hum, and/or whistle before a performance, as it “warms up” the throat, tongue, and lips. You can also intone a few of your favourite tunes as a way of preparing your body and mind for a public speaking engagement. The point isn’t to become a great singer, of course; it’s to work your vocal chords.